Most people prefer Gulal to play Holi as it is less harmful and easily washable as compared to wet colors. Gulal is also used during Holi Puja. Gulal is used in huge quantities in various temples. It is believed that during Lathmar Holi in Barsana, the temple procured 3 Quintal of Gulal which is equivalent to 300 kilograms. The same quantity of Tesu flowers were also used to color the water by the temple. The Gulal(s) are made by mixing different colors to Ararot. Ararot is a starch made from Arrowroot and it is very similar to corn starch. 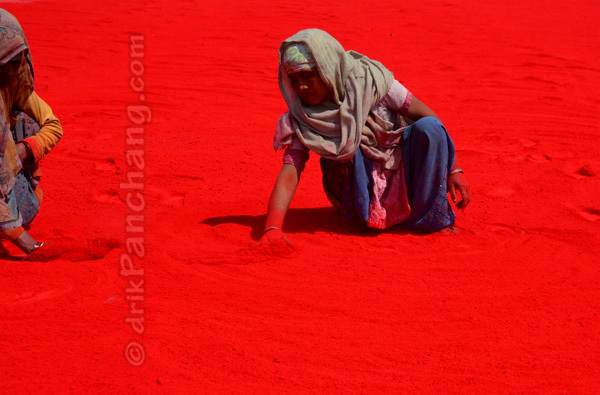 As Ararot is easily available in huge quantity it is used to make Gulal during Holi. The preparation to make Gulal starts four months prior to Holi. The process involves mixing the water and the chemical in the right proportion into the Ararot powder. The mixture is crushed, filtered and spread in the open space to dry. It is the chemical which might cause health issues and due to which herbal Gulal is preferred over synthetic Gulal. The Gulal has no shine. Abeer is added to the Gulal to make it shiny. Abeer can be made of natural ingredients as well as synthetic materials. The most used synthetic Abeer is made out of Mica. Synthetic Abeer made out of Mica might be harmful to the body. However natural Abeer can also be made out of Tesu tree. Gulal is always hyphenated with Abeer and mostly heard as Abeer-Gulal in various Holi songs. In north India, red, yellow, pink and purple Gulal is being sold for Rs. 40 per kilogram. However when it comes to color it is the pink Gulal which is preferred over various other colors.